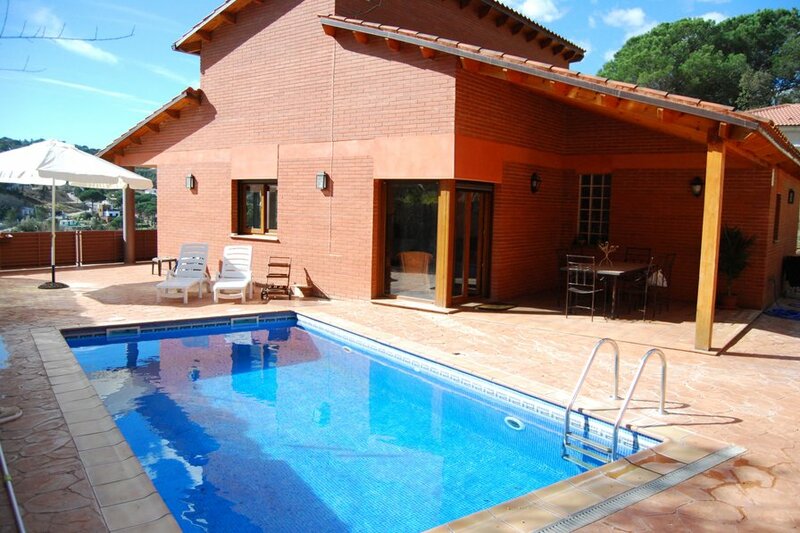 Nice house,with private pool,located in a quiet area of Lloret de Mar. Villa Lola is a beautiful house situated on a plot of 800m2 and located in a quiet area of the Aiguaviva Park. This beautiful house has a living area of 230m2 distributed on three floors and sleeps 8 people. The first floor has one double bedroom and one twin room with bunk beds; a bathroom with a shower; a spacious well equipped living room with TV, satellite, DVD and fireplace, with access to the terrace and pool area. It also has a nice kitchen with a microwave, oven, dishwasher, fridge freezer and a wooden table. The second floor consists of 2 spacious double bedrooms with dressing areas and terrace access and finally a full bathroom with a tub. The ground floor is composed of the garage and a bathroom with a shower. The car is necessary to could go to the beach and to the centre of the village, so this is not possible to go walking for the distance to everywhere and there're no much buses in the area. This house is located in Lloret Residencial, a housing development located between Lloret de Mar centre and Vidreres, at 8.5 km (a car is necessary) from the centre of Lloret. In the village of Lloret you 'll find all the ameanities you need for you and for the whole family to could enjoy a wonderful holidays of relax or activities. It's a place full of restaurants, shops, bars, children areas... you also can enjoy a funny day in the water park (Water World) in the same village.